Some people are driven to be the first to do something. Think Sir Edmund Hillary and Mount Everest. The Wright brothers and flying. Alexander Graham Bell and the first phone call. Russian BASE jumper Valery Rozov is such a person. 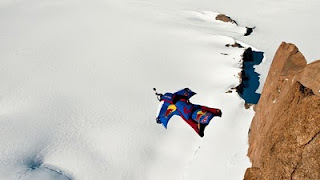 In a wingsuit, he was the first to skydive into the crater of the Mutnovsky Volcano in Kamchatka, Russia, this after being the first to skydive from the highest point of Mount Elbrus in Europe. He made headlines. ﻿The BASE jumper with 8,000 BASE jumps under his wings, Rozov made headlines again, this time in Antarctica. He became the first to ever climb the 9,616-foot Mount Ulvetanna in Antarctica and jump off. And oh by the way, the temperatures were as low as 22 below. According to the RedBull story posted earlier this month, Rozov flew for 45 seconds down the face of the mountain before opening his parachute and landing safely (see above video). "It was like a journey to another planet," he said. "It's deeply satisfying and has given me a long and lasting feeling of happiness." Apparently, he wasn't the first BASE jumper to make a jump in Antarctica, however. The story says he also BASE jumped after ascending Tungespissen and the Holtanna, the only mountain in the Antarctic that had previously been used by a BASE jumper. Details, details. Our suggestion for the next "first" for Rozov? Climb Mount Everest, skydive to the bottom and phone home to become the first to combine the firsts of Hillary, the Wright Bros. and Bell with the ultimate skydive. Good luck with that. Thanks to The Outside Blog for the tip.